Whispers in the Loggia: "Life Is a Unique Gift at Every Stage"
I am very pleased to be among you, the residents of Saint Peter’s and to thank Sister Marie Claire and Mrs Fasky for their kind words of welcome on your behalf. I am also pleased to greet Archbishop Smith of Southwark, as well as the Little Sisters of the Poor and the personnel and volunteers who look after you. As advances in medicine and other factors lead to increased longevity, it is important to recognise the presence of the growing numbers of older people as a blessing for society. Every generation can learn from the experience and wisdom of the elderly, of the generation that preceded it. Indeed the provision of care for the elderly should be considered not so much an act of generosity as a repayment of a debt of gratitude. 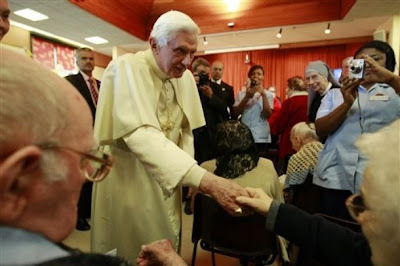 For her part the Church has always had great respect for the elderly. The Fourth Commandment, ‘Honour your father and your mother as the Lord your God commanded you’ is linked to the promise, “that your days may be prolonged and that it may go well with you, in the land which the Lord your God gives you’. This work of the Church for the infirm not only provides love and care for them, but is also rewarded by God with the blessings he promises on the land where this commandment is observed. God wills a proper respect for the dignity and worth the health and well-being of the elderly and through her charitable institutions in Britain and beyond, the Church seeks to fulfil the Lord’s command to respect life, regardless of age or circumstances. At the very start of my pontificate I said, “Each of us is willed, each of us is loved, each of us is necessary’. (Homily at the Mass for the beginning of the Petrine Ministry of the Bishop of Rome, 24 April 2005). Life is a unique gift, at every stage from conception until natural death and it is God’s alone to give and take. One may enjoy good health in old age; but equally Christians should not be afraid to share in the suffering of Christ, if God wills that we struggle with infirmity. My predecessor, the late Pope John Paul, suffered very publicly during the last years of his life. It was clear to all of us that he did so in union with the sufferings of our Saviour. His cheerfulness and forbearance as he faced his final days were a remarkable and moving example to all of us who have to carry the burden of advancing years. In this sense, I come among you not only as a father, but also as a brother who knows well the joys and the struggles that come with age. Our long years of life afford us the opportunity to appreciate both the beauty of God’s greatest gift to us, the gift of life, as well as the fragility of the human spirit. Those of us who live many years are given a marvellous chance to deepen our awareness of the mystery of Christ, who humbled himself to share in our humanity. As the normal span of our lives increases, our physical capacities are often diminished; and yet these times may well be among the most spiritually fruitful years of our lives. These years are an opportunity to remember in affectionate prayer all those whom we have cherished in this life, and to place all that we have personally been and done before the mercy and tenderness of God. This will surely be a great spiritual comfort and enable us to discover anew his love and goodness all the days of our life. With these sentiments, dear brothers and sisters, I am pleased to assure you of my prayers for you all and I ask you for your prayers for me. May our blessed Lady and her spouse Saint Joseph intercede for our happiness in this life and obtain for us the blessing of a serene passage to the next.